Pages from this month's issue of KeroKero Ace magazine have been leaked two days early, revealing key cards from TD10: Purgatory Revenger and BT12: Binding Force of the Black Rings. Although additional news is still forthcoming, for now the below images have begun circulating through Twitter and the Japanese blogosphere. Among the highlights of the issue are the skills of Revenger, Raging Folm Dragon, which merge the abilities of Spectral Duke Dragon, Phantom Blaster Overlord and Chromejailer to create a unique winning image for the Revenger series. 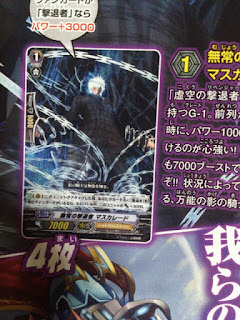 The Dark Irregulars have received a new "Amon" subgroup, to support their upcoming Reverse card. 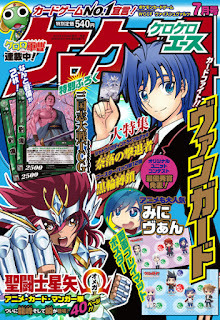 The below translations were done by NeoArkadia. 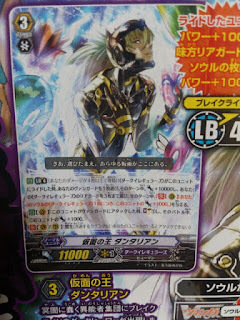 Flavor text was translated by Touya. 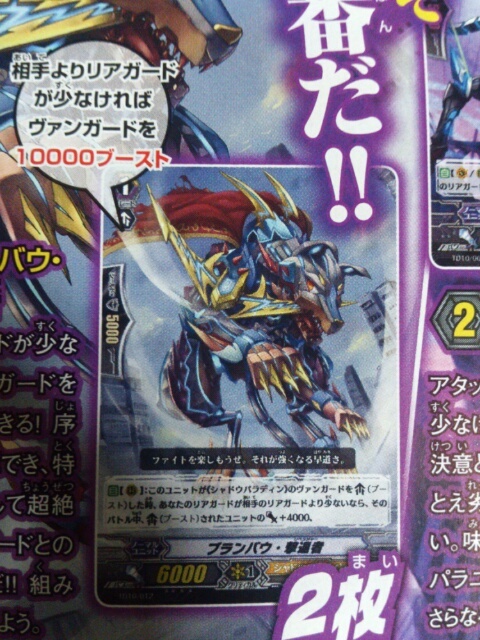 Demon Dragon Who Rules The Heavens, Dungaree "Unlimited"
[AUTO] (V) LB4: [Counterblast 2, Bind the Top Card of your Deck] When this Unit attacks, pay the cost. 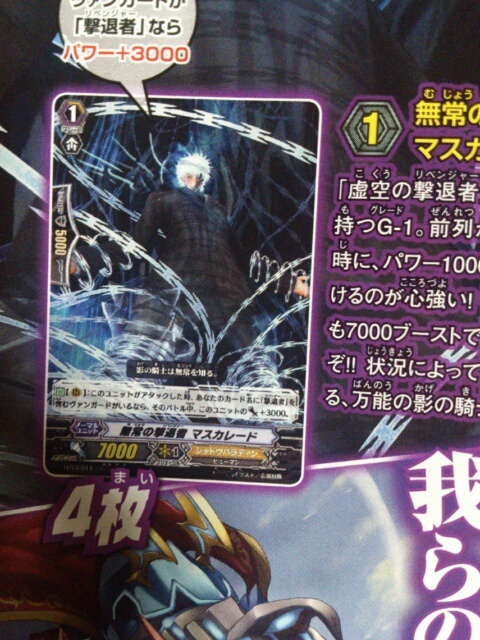 If you do, target an opponent's front row Rearguard, retire it, and during this turn, for each of your bound <<Narukami>>, this Unit gains 2000 power. 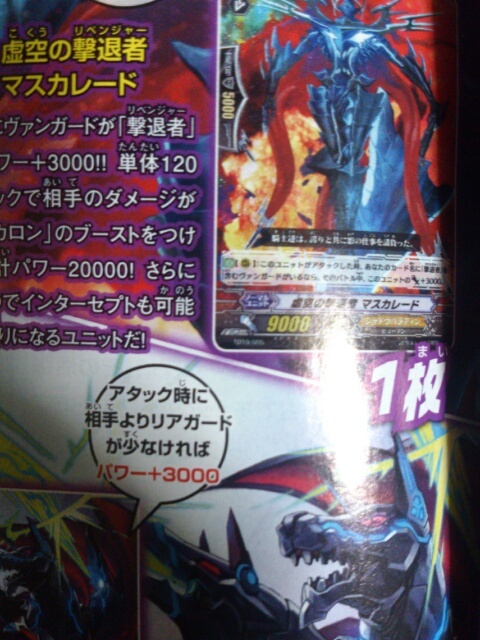 [CONT] (V) If you have "Sealed Demon Dragon, Dungaree" in your Soul, this Unit gains 2000 Power. [AUTO] (V) LB4: Target 3 of your “Revenger” Rearguards, retire them. 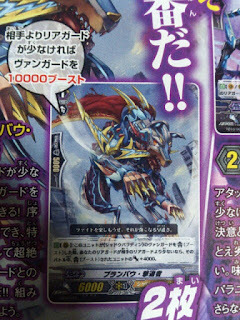 At the end of a Battle in which this Unit attacked, you can pay the cost, if you do, target up to 1 “Revenger, Raging Folm Dragon” in your hand, Ride it, target your Vanguard, and during this turn that unit gains [Power]+10000. [AUTO] (V): [Counterblast 1]: When this unit attacks, you can pay the cost. 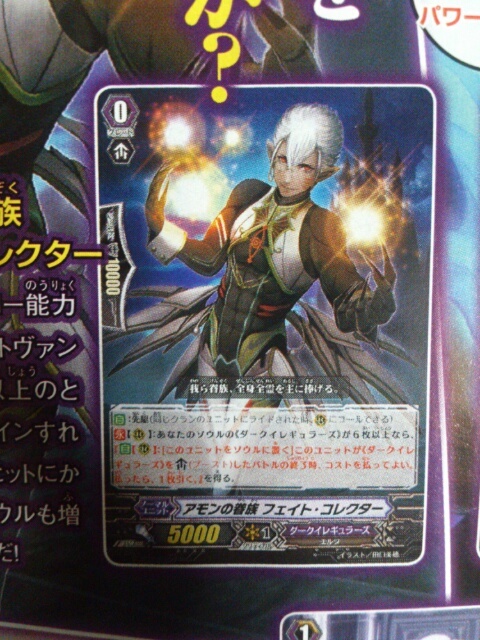 If you do, this unit gains [Power]+3000 during this battle. 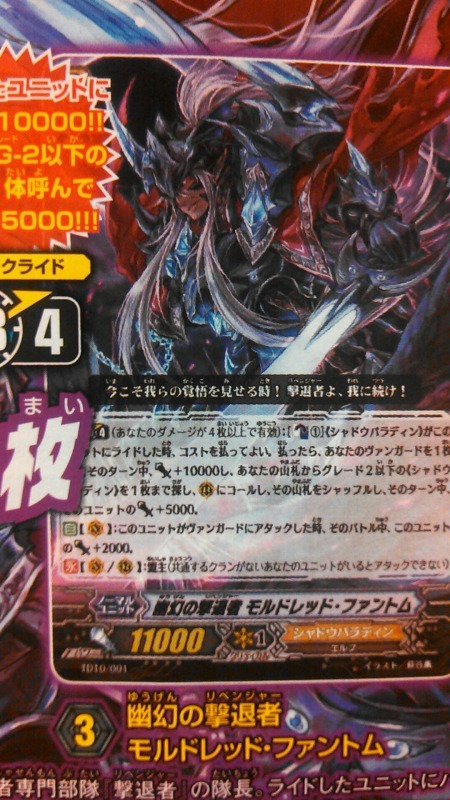 [AUTO] LB4: [CB1] When a "Shadow Paladin" Rides this Unit, you can pay the cost. If you do, target 1 of your Vanguards, it gains [Power]+10000 during this turn. 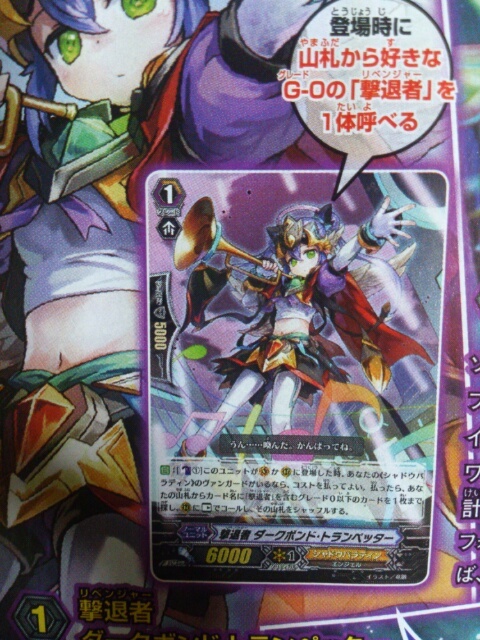 Search your Deck for up to 1 Grade 2 or lower "Shadow Paladin", call it as a Rearguard, then shuffle your Deck, and that Unit has [Power]+5000 during this turn. [AUTO] (V): When this Unit attacks the Vanguard, during that batle, this Unit has [Power]+2000. 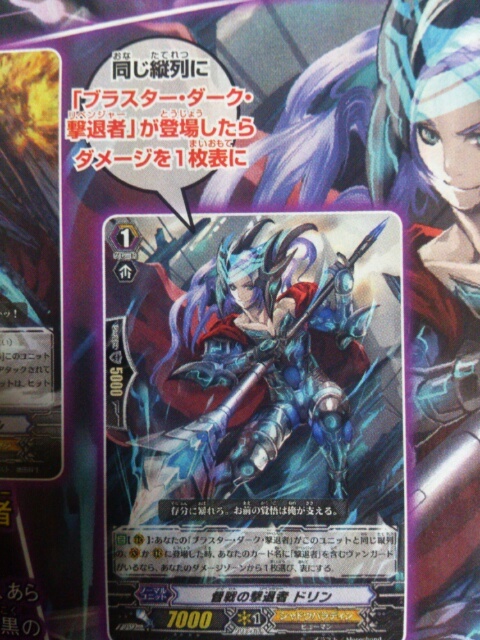 [AUTO]: [Counterblast 2] When this Unit appears in the Vanguard or Rearguard Circle, if you have a <<Shadow Paladin>> Vanguard, you may pay the cost. 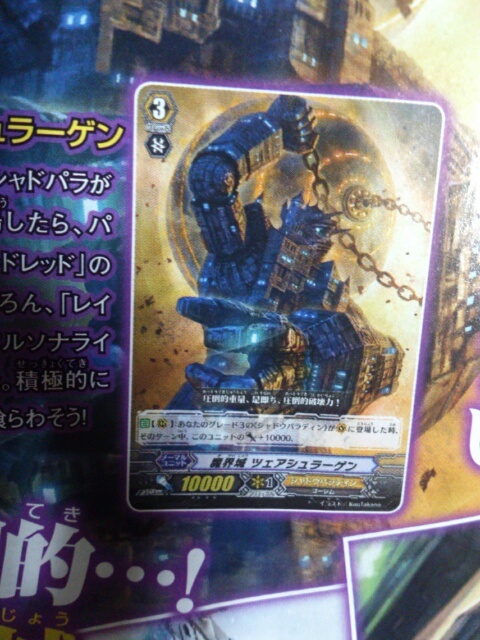 If you do, look through your Deck for up to 1 Grade 1 or lower "Revenger" Card in your Deck, call that Unit to a Rearguard Circle on the same column as this unit, then shuffle your Deck. 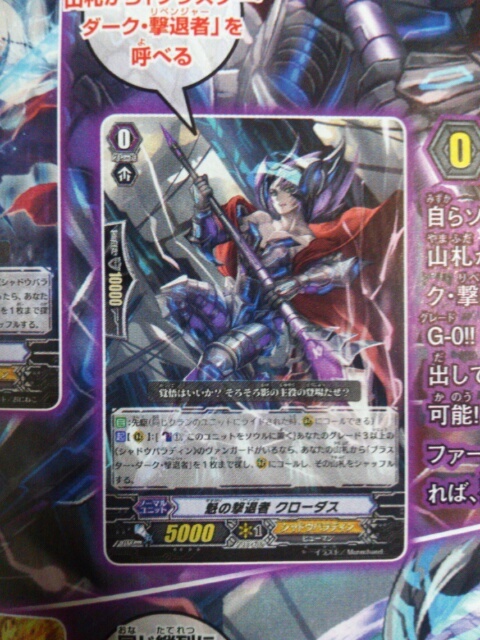 [AUTO]: [Counterblast 1] When this Unit appears in the Vanguard or Rearguard Circle, if you have a <<Shadow Paladin>> Vanguard, you may pay the cost. 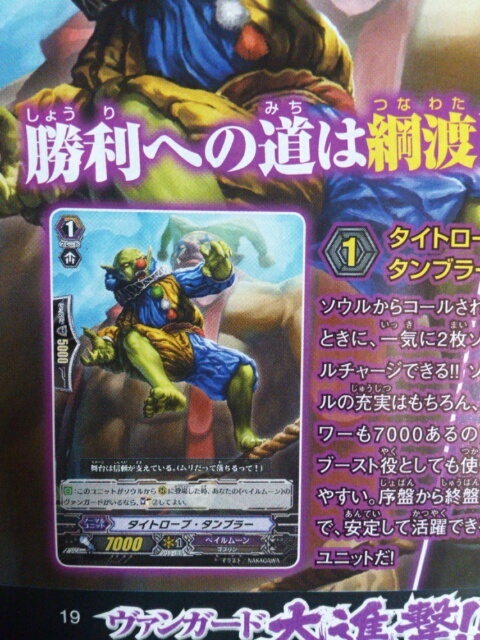 If you do, look through your Deck for up to 1 Grade 0 or lesser "Revenger," call that Unit to a Rearguard Circle at Rest, then shuffle your Deck. 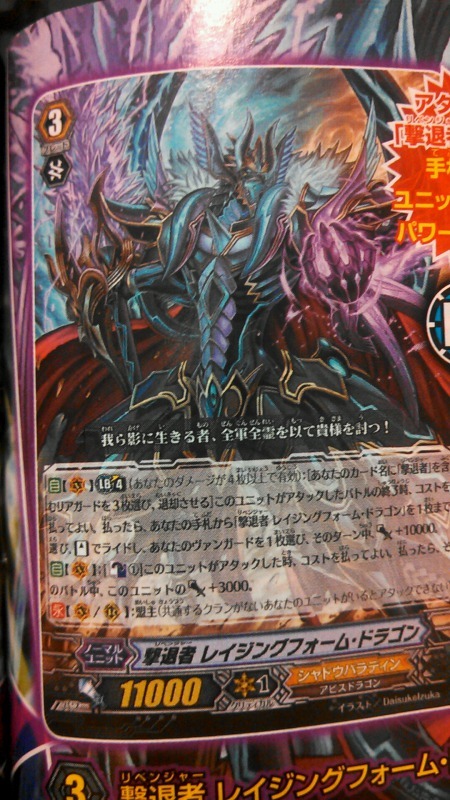 [ACT] (R): [Counterblast 1, Place this Unit in your Soul] If you have a Grade 3 or higher "Shadow Paladin" Vanguard, search your Deck for up to 1 "Blaster Dark, Revenger", call it to a Rearguard Circle, then shuffle your Deck. [AUTO] (R): When your "Blaster Dark Revenger" appears in a vanguard or rearguard circle on the same column as this unit, and your vanguard has "Revenger" in its card name, choose 1 card from your damage zone, and turn it face up. 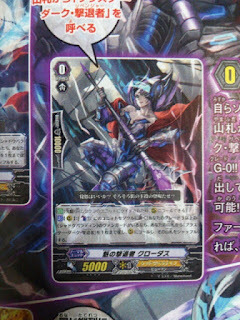 [AUTO] (R): When this Unit boosts a <<Shadow Paladin>> Vanguard, if you have more Rearguards than your opponent, during this battle, the boosted Unit gains [Power]+4000. [AUTO] (RC):When this unit attacks, if you have a vanguard with "Revenger" in its card name, this unit gets [Power]+3000 until end of that battle. 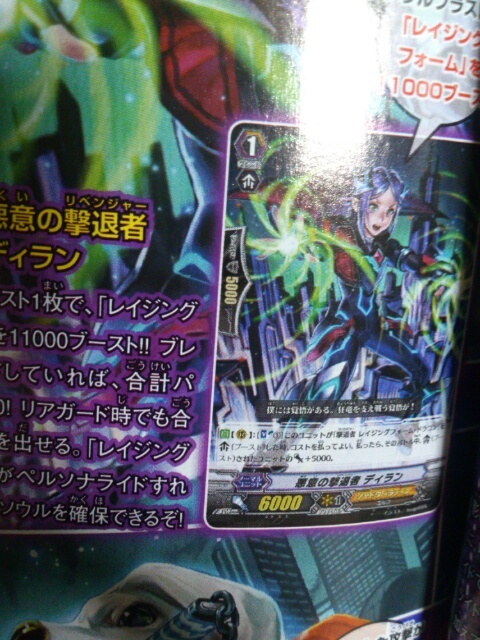 [AUTO] (R): When this Unit attacks, if you have a "Revenger" Vanguard, this Unit gains 3000 Power. 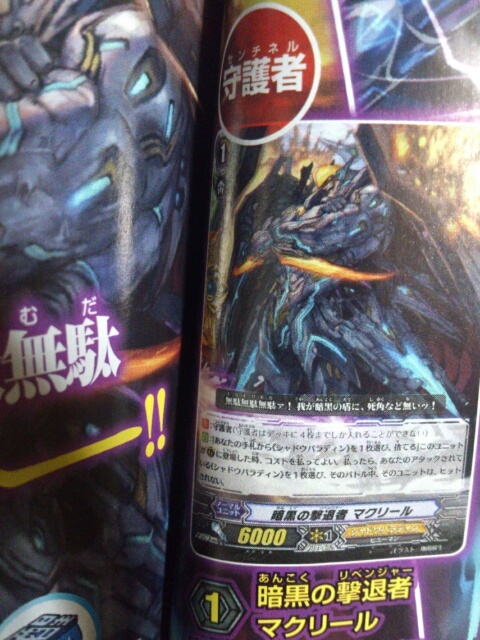 [AUTO]: [Place this Unit in your Soul] When this Unit boosts a Shadow Paladin with LB4, during this battle, if its Attack hits the Vanguard, you can pay the cost. if you do, draw 1 card. 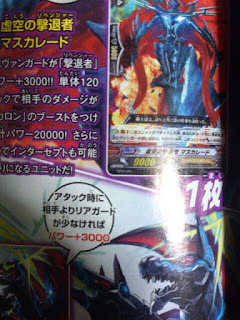 [AUTO (R): [Soulblast 1] When this Unit boosts "Revenger, Raging Folm Dragon", you can pay the cost. If you do, the boosted Unit gains an additional 5000 Power. 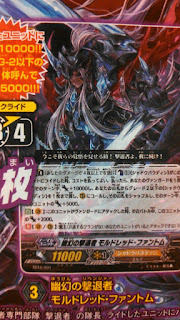 [AUTO] (R): When a Grade 3 <<Shadow Paladin>> appears in the Vanguard Circle, this Unit gains 10000 Power this turn. 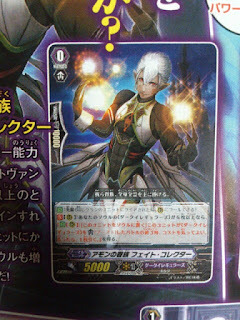 [AUTO]: [Choose a «Shadow Paladin» from your hand, and discard it] When this unit is placed on (GC), you may pay the cost. If you do, choose one of your «Shadow Paladin», and that unit cannot be hit until end of that battle. 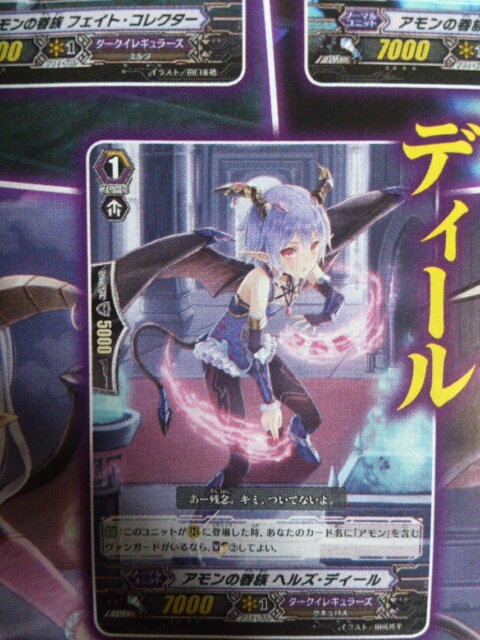 [AUTO] (LB4): When a <<Dark Irregulars>> Rides this card, choose 1 of your Vanguards, it gains [Power]+10000 during this turn and choose up to 3 of your <<Dark Irregulars>> Rearguards, during this turn, they gain "Cont (R): This Unit gains 1000 Power for each <<Dark Irregulars>> in your Soul". 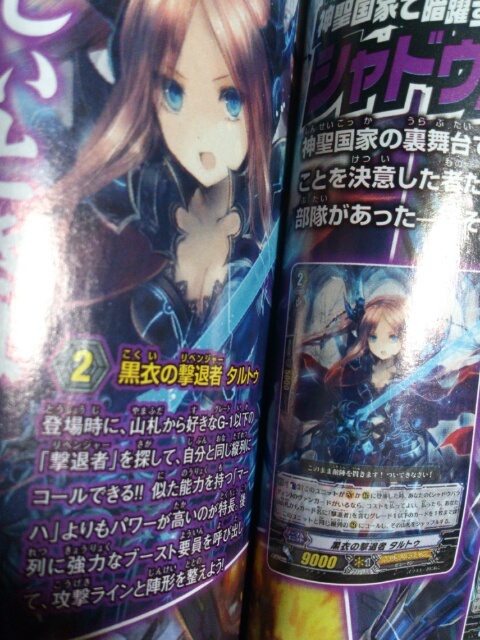 [AUTO] (V): When this Unit attacks the Vanguard, Soul Charge 1, this Unit gains [Power]+1000 during this Battle. 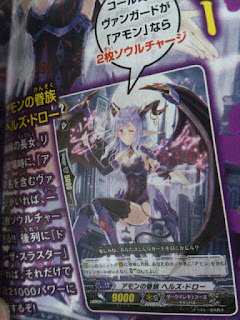 [CONT] (R): If your Soul has 6 or more <<Dark Irregulars>> in it, this Unit gains <<Auto (R): [Place this Unit in your Soul] At the end of a Battle in which this Unit boosts a <<Dark Irregulars>>, you can pay the cost. If you do, draw 1 card. 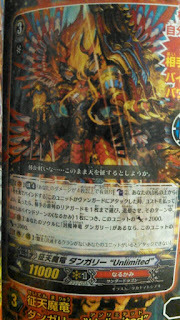 [AUTO]: When this Unit appears in the Rearguard, if you have an "Amon" Vanguard, you can Soul Charge 2 cards. 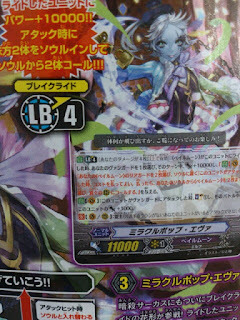 [AUTO]: When this Unit appears in a Rearguard Circle, if you have an "Amon" Vanguard, you can Soul Charge 2 cards. 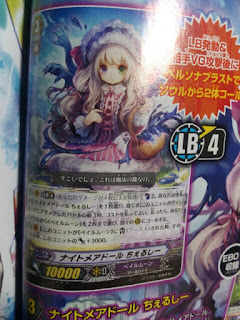 [AUTO] (V) LB4: [Counterblast 2, Choose 1 "Nightmare Doll, Chelsea" in your hand, discard it] At the end of a Battle in which this Unit attacks a Vanguard, you can pay the cost. If you do, choose up to 2 "Pale Moon" in your Soul, call them to seperate Rearguard Circles. 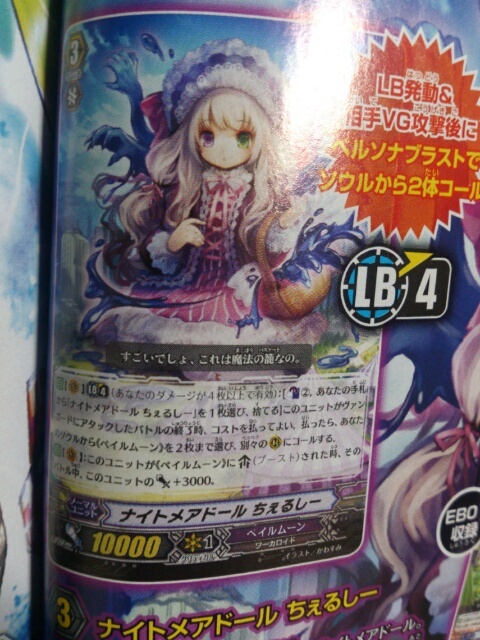 [AUTO] (V): When this unit is boosted by a <<Pale Moon>>, during that battle, this unit gets [POWER]+3000. 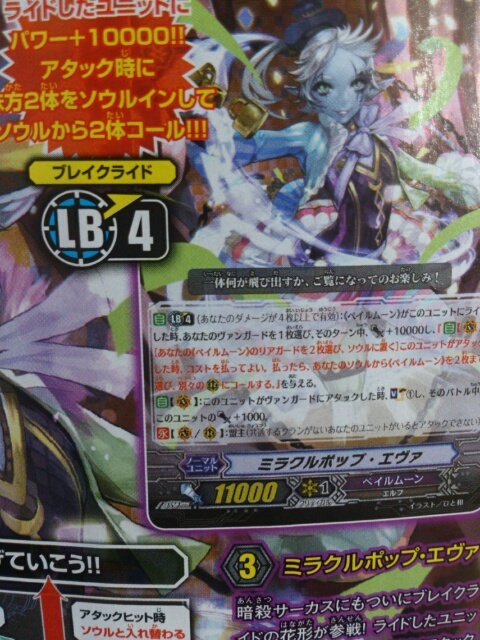 [AUTO]: When this Unit appears in a Rearguard Circle from the Soul, if you have a <<Pale Moon>> Vanguard, you can Soul Charge 2. 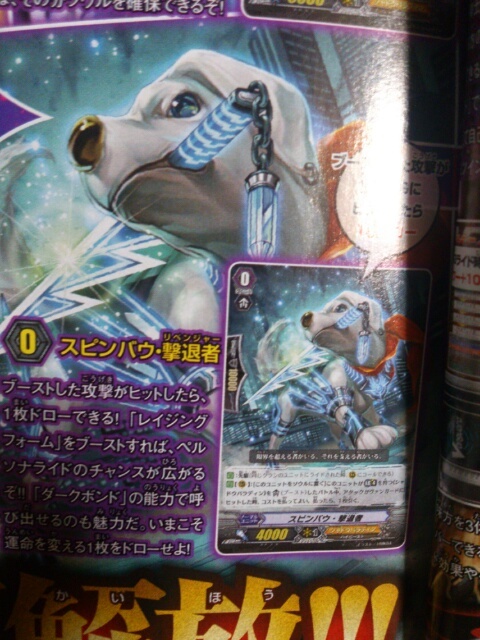 [AUTO] (V): When this Unit is ridden by a <<Pale Moon>>, Choose 1 of your Vanguards, it gains [Power]+10000 this turn and gains "Auto (V): [Choose 2 of your <<Palemoon>> Rearguards, place them in the soul, when this Unit attacks, pay the cost. If you do, Choose up 2 <<Pale Moon>> in your Soul, and call them to separate Rearguard Circles."